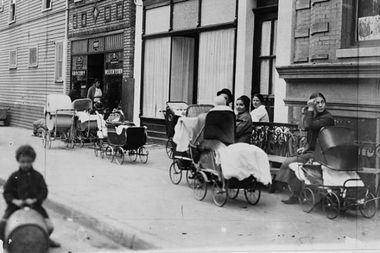 On the morning of Oct. 16, 1916, a long line of Brooklyn residents and their baby carriages formed outside a Brownsville brownstone. “Can you afford to have a large family?” read the leaflets that summoned them in English, Italian and Yiddish. Almost 500 women from the Italian and Jewish immigrant families of the neighborhood visited the two-room clinic for advice on and demonstrations of contraceptive methods — before the police shut the operation down and arrested staff for violating a New York State law that banned birth control on the grounds of obscenity. The backlash was just what clinic founder Margaret Sanger, a former obstetric nurse working on the Lower East Side, expected. After touring the country with the message of contraception as a means of family planning for all Americans, the activist resettled in New York City with a plan to challenge state law and kindle public support for her cause. Enlisting the help of a registered nurse, her sister Ethyl Byrne, and an interpreter, Fania Mindell, Sanger provided services that defiantly championed a woman’s right to control her own fertility. “I absolutely believe she was doing it as a statement to violate the law and get herself arrested,” said the activist’s grandson and former president of Planned Parenthood of New York City, Alexander Sanger. Living in the West Village, Margaret Sanger drew inspiration from the city’s liberal intellectual circles of socialists, anarchists and labor unionists. “In this early progressive era, there was a lot of optimism about how one could bring about change in the world,” said her grandson, who still lives in Manhattan. Tracing its roots back to the Brownsville clinic, 100 years on Planned Parenthood now serves 2.5 million patients in about 600 centers across the U.S.
“We’re the only national network of [women’s] health care services and it all started with Margaret Sanger’s clinic in Brooklyn,” Malin said.